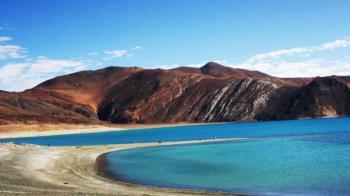 Pangong Lake is a high grassland lake which is also known as Pangong Tso. The lake is situated at a height of about 15000 ft in the himalayas and 134 km long which extends from India to China. During winter the lake freezes completely, despite being saline water. It is not a part of Indus River basin area and geographically a separate land locked river basin. Dachigam National Park, literally stands for "ten villages" with covering an area of 141 sq. kms. is located 22 away from the Srinagar. The park could be in the memory of ten villages that were reallocated for the formation of the Park. From the year 1910, the park is in protected area first under the maharaja of Jammu & Kashmir and later under the concerned government authorities. The park was initially created for the supply of the clean drinking water to the Srinagar city and later on was declared as the Nationa Park in the year 1981. Kashmir approximate known as the Paradise on Earth is rich in lakes, mountain tarns and swampy lagoons that attract tourists from far and near. One of the largest Fresh water Lake of Asia is Wular lake ( Also pronounced as wullar lake) located in Bandipur District in the state of Jammu & Kashmir. The lake is fed by Jhelum River and lake basin was formed as a result of tectonic activity. The lake size varies from 30 to 260 square kilometers, as per changing seasons. Boating, water sports and water ski have recently been launched by the Government of India Tourism in collaboration with Kerala Tourism and J&K Tourism. The contract for the operation of the site was awarded in September 2011. Kargil is in the kargil district of Ladakh in the Indian State of Jammu & Kashmir. It is the second largest town after in Ladakh after Leh and is situated near the Line of Control facing the Pakistan-administered region of Gilgit-Baltistan to the north, and the Jammu and Kashmir divisions to the west. Kargil is located 60 km and 204 km from Drass and Srinagar to the west respectively, 234 km from Leh to the east. Earlier Kargil was known as "Purig". 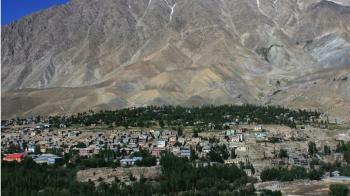 The name Kargil is derived from the words Khar and rKil. Khar means Castle and rKil means Centre thus a place between castles as the place lay between many kingdoms. Theory behind this is that the Kargil is derived from the words "Gar" and "Khil". Gar in local language mean ‘Anywhere’ and Khil means a central place where people could stay. Kargil has an average elevation of 8,780 feet and is situated on the banks of Indus river. 77% are Muslims, of which 65% follow Shia Islam. Buddhism and Hinduism represent 14.5% and 8% of the total population. The popular skiing destination is the state of Jammu and Kashmir is the Gulmarg which is located in Baramula district and a notified area committee. It is situated in the Pirpanjal Range in western Himalayas. 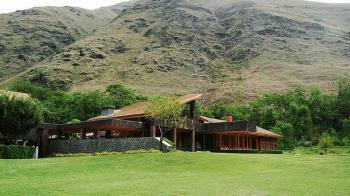 It lies in the cup shaped valley at an alltitude of 8,694 ft, 56 km from Srinagar. Gulmarg was rated as the Asia's best ski destination and is the "heartland of winter sports in India" Winter sports like skiing, Tobogganing, Snow Boarding and heli-skiing take place on the slopes of Mount Apharwat reachable by a Gondola lift. 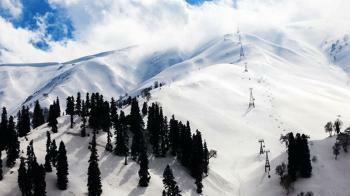 These winter sports are carried out at a height of 13,999 ft. An annual three-day Gulmarg Winter Festival is held in March. 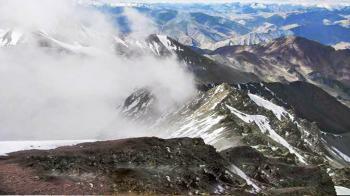 On the many points of Apharwat peak and Khilanmarg offer a panoramic view of Namga Parbat and Harmukh mountains. Diskit Monastery is also known as the Diskit Gompa and is the oldest and the largest Buddhist Monastery, in the Nubra Valley of Ladakh of Jammu & Kashmir. Monastery was founded by Changzem Tserab Zangpo, a disciple of Tsong Khapa, founder of Gelugpa, in the 14th century. A statue of Cho Rinpoche is in the prayer hall in the monastery. A huge drum and several images of fierce guardian deities are also there in the prayer hall. A school is runs by the monastery administrations with the support from a Non-Government Organization (NGO) known as the "Tibet Support Group", which has computer facilities and teaches science subjects, in English, to Tibetan children of the region. A popular festival known as the "Festival of the Scapegoat" is held in the precincts of the monastery in February during the winter season. Srinagar, the largest city and the summer capital of the Indian State of Jammu & Kashmir situated in the center of Kashmir valley on the banks of Jhelum river, a tributary of the Indus, and Dal and Anchar lakes and is surrounded by five districts. 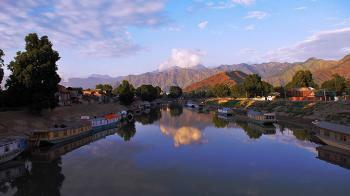 Srinagar is famous for Lakes, Gardens, Waterfronts and houseboats. It is also known for traditional Kashmiri handicrafts and dried fruits. 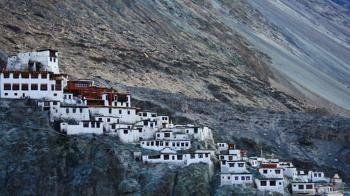 The second largest district in the country is known as, Leh. It covers an area of 45,110 sq km. Leh district is situated roughly between 32 to 36 degree north Latitude and 75 to 80 degree East longitude and at an altitude of 11,562 ft in the state of Jammu & kashmir. The town is dominated by the ruined Leh Palace, the former mansion of the royal family of Ladakh, built in the same style and about the same time as the Potala Palace- the chief residence of the Dalai Lama until the 14th Dalai Lama fled to Dharamshala, India, during the 1959 Tibetan Uprising. 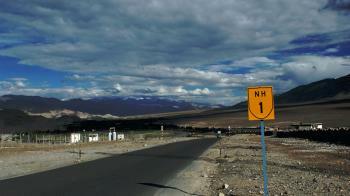 Leh is well connected via National Highway 1D to Srinagar in southwest to Manali in the south via the Leh-Manali Highway. Hemis National Park, a high alltitude national park located in the eastern ladakh region of Jammu & Kashmir in India. The Park extends overs 600sq. km. and is named after the famous monastery. It is known for the some rare species Bharal and Snow Leopard. It is the best place to see the snow leopard.It is believed that the National Park have the high density of the snow leopard of protected area in the world. Amarnath cave is one of the most famous of Hindu temples located in Jammu and Kashmir, India. 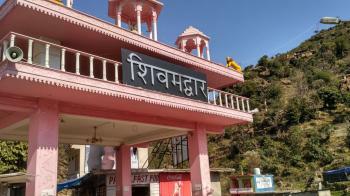 This temple dedicated to Lord Shiva. Shri Amarnathji Cave Shrine stands at 3,888 m and is 45 km from Pahalgam and 141 km from Srinagar. 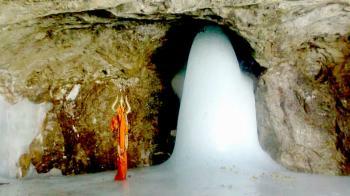 Amarnath is a world famous Ice cave where Shivalingam is appears on particular period. Approximately at a height of 12,760 feet, the Amarnath Cave is visited by many devotees each year to see Lord Shiva’s lingam, which is naturally formed with ice. It is one of the ancient rituals in india and very holy place for indian people. Millions of devotees trek through the daunting mountains to Shri Amarnathji Shrine in South Kashmir every year in the summer months to pay obeisance. The cave is surrounded by snowy mountains. The cave itself is covered with snow most of the year except for a short period of time in summer when it is open for pilgrims in the month of July / August. Vaishno Devi is located in Jammu and Kashmir, India. It is one of the holiest pilgrimage places in the country. Being the holiest pilgrimage for hindus Vaishno devi is a place where you seriously feel that god exists. Vaishno Devi, also known as Mata Rani, Trikuta and Vaishnavi, is a manifestation of the Hindu Mother Goddess Mahalakshmi. The shrine is located inside a cave. This cave is present inside a three-peaked mountain called Trikuta or Trikoot. It's a place to where people climb not with the help of their body stamina but with their trust and enthusiasm to have darshan of the great Mata Vaishno Devi. 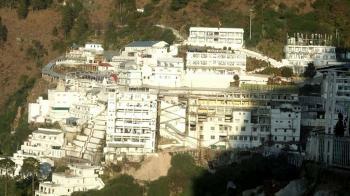 Vaishno Devi temple is open for pilgrims throughout the year that's why Millions of devotees go there. But maximum visitors plan their trip during the Navratras. Shalimar Bagh is one of the beautiful gardens in Srinagar. 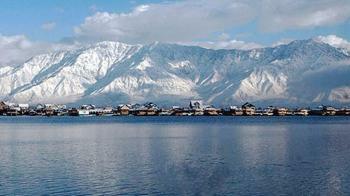 Srinagar is the largest city of the Kashmir Valley and the summer capital of the Indian state of Jammu and Kashmir. The term Shalimar comes from Sanskrit language which means “Adobe of Love”. This famous garden lies at the far end of the Dal Lake. The garden is currently owned and managed by Jammu and Kashmir tourism department. 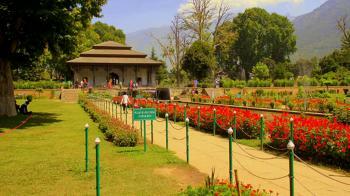 It is the best among the Mughal gardens and a must visit place if you are in Srinagar. The garden is clean,well maintained and beautiful. Best time to visit this place is in April or May when the flowers are full bloom. I recommended you to visit this place which is also great place for Photography.